Anyone who has had close friendships knows that while these relationships are rewarding, they often require hard work to maintain, and some people have more success than others at keeping such friendships up. Who then, are the people who manage to maintain friendships — and what behaviors and processes lead to high levels of friendship satisfaction? In a 2015 study published in the European Journal of Personality, researchers Robert Wilson (University of California, Davis), Kelci Harris (Washington University in St. Louis), and APS Board Member Simine Vazire (University of California, Davis) examined the relationships among different aspects of personality and friendship satisfaction. Studies examining relationship satisfaction traditionally have focused on romantic and marital relationships and shown that people who display the personality traits of extraversion, agreeableness, and conscientiousness have more satisfying relationships, while those high in the personality trait of neuroticism do not. The few studies that have examined the relationship between personality and friendship satisfaction have found that the traits of extraversion and agreeableness are associated with having more friends, closer friendships, and attaining a higher social status; however, few studies have examined the influence relationship between the traits of conscientiousness, openness, and neuroticism and friendship satisfaction. To better understand how personality influences friendship satisfaction, the researchers had participants complete an in-lab personality questionnaire, had them to rate their level of friendship satisfaction and life satisfaction, and asked them to nominate six friends to rate their personality. Participants then completed surveys four times a day for 14 days outside of the lab. These surveys asked participants to report on their personality states (i.e., what they were like at that particular time; e.g., rude, happy, considerate), their behaviors, and their social interactions during specified hour blocks spaced throughout the day. From these measures, the researchers computed participants’ Big Five personality traits (i.e., extraversion, agreeableness, conscientiousness, neuroticism, and openness), their friendship-role personality (i.e., their personality state when interacting with friends), and the quality and quantity of their interactions with friends. They found that while the personality traits of extraversion, conscientiousness, and agreeableness were associated with increased friendship satisfaction, neuroticism was associated with lower friendship satisfaction and openness was not related to friendship satisfaction at all. Although the quantity and quality of social interactions were found to be associated with friendship satisfaction, neither was found to account for the association between personality and friendship satisfaction. These results suggest that there are individual differences in friendship satisfaction and that these differences are a result of differences in personality and not differences in the quality or quantity of interactions. This research adds to the limited work examining friendship satisfaction. 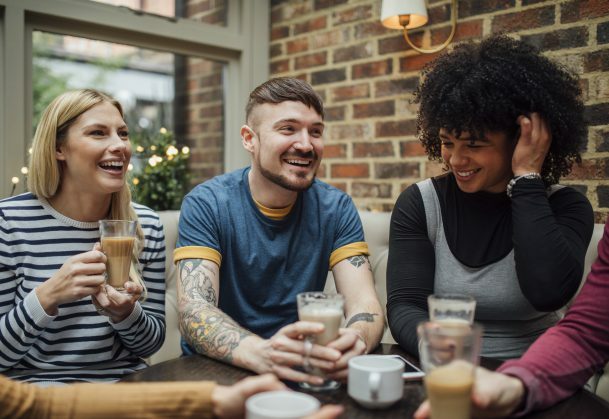 The researchers encourage others to continue examining the interactions among personality, interpersonal processes, and friendship satisfaction in a variety of populations. Wilson, R. E., Harris, K., & Vazire, S. (2015). Personality and friendship satisfaction in daily life: Do everyday social interactions account for individual differences in friendship satisfaction? European Journal of Personality, 29, 173–186.